This week we’re featuring the town of New Providence, Iowa and sharing some of the stories of rural revival happening here! Today’s guest blog post is from Slade Faris, Marine Corps veteran and District Sales Manager for Champion Seed. Welcome, Slade, and thank you for your service to our country! My name is Slade Faris and I’m a District Sales Manager with Champion Seed. I’ve lived in rural New Providence for about four years, but was born and raised in the neighboring town of Eldora. The Faris family has lived around New Providence since the late 1850s, giving us deep roots in the community and a lot of relatives dotting the surrounding area. 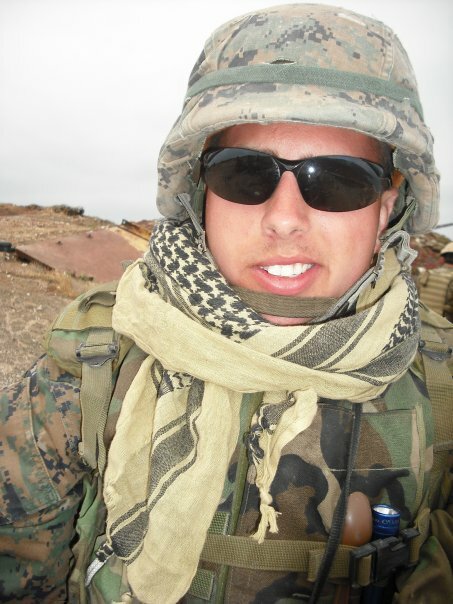 After graduating from South Hardin High School, I joined the Marine Corps and headed for southern California. While others back in Iowa thought I was lucky to be living on the west coast, that’s where I learned there really is no place like home. The thrills of the city don’t replace knowing your neighbors and being part of a community. In 2012 after a couple deployments, I decided to head home and start school instead of re-enlisting. Because I was about four years older than my peers, I challenged myself and in 2015 graduated from Iowa State University with a Bachelor’s Degree in Agricultural Studies. With my degree complete and an eagerness to get back home, I moved to my grandparents’ farm just outside of New Providence shortly thereafter. After moving, I had taken a job with a local farmer. While I enjoyed this job, I was looking for other ways to contribute and challenge myself, leading me to start my own seed dealership. This allowed me to work closely with nearby farmers and help them make decisions regarding their farming operations. As time went on I knew I needed a career with benefits and found a place with Iowa Select Farms. After a year or so, I knew I didn’t want to be pinned behind a desk and needed to be out helping farmers. With some research, I took a position at a local, family-owned, independent brand: Champion Seed. One of the biggest positives for me was I never had to leave the area to find the perfect job. The flexibility I have has allowed me to play bigger roles within the community, such as being involved with the New Providence Fire Department as well as town committees. New Providence is fortunate to have young business owners starting businesses downtown. Their efforts to revitalize the community are huge in comparison to the small amount of work I have contributed. These business owners are filling the shoes of older members in the community and pushing to make New Providence a better place to live and do business. With their help, the town’s small festivals and events have seen expansion, attracting more people and new faces to town in the process. As the community’s spirit has continued to grow, it has allowed for other local events to take place such as craft shows, workshops, and the Christmas tree lighting and soup supper. The tree lighting and soup supper have been a tremendous hit. This year our local professional photographer Sommer Mosch was taking photos while kids see Santa; yet another example of how our community focuses on supporting entrepreneurs. We took an event that we created, used it as an opportunity to raise funds for other town festivals, and found a way to make it a better experience for those attending and put a local business in the spotlight.